$87.45 - One Year non-recurring membership - One Month Free! 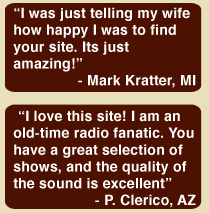 In response to our members wishes, we also have an FTP membership plan where you can use simple, free software to download our shows at the level of your interest and get access to all of our Vintage Video to boot! Check out our FTP Membership page. Our membership provides unlimited downloads per month, we're talking jiggabytes here! So whatcha waitin' for? sign up here and get to downloading! You have our guarantee of satisfaction. We will refund your current subscription fee if you are dissatisfied with the site. Memberships are self-renewing but canceling is easy. Payments are processed through our secure credit card page and, if you prefer, PayPal which has become the web's default payment method.